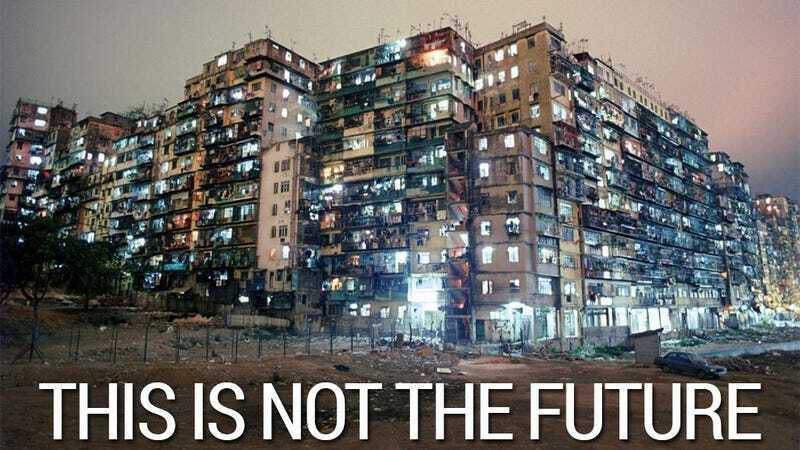 Kowloon Walled City was the closest this planet has ever come to having our own, real Mega-City One. Poverty, people packed in like sardines, drugs, prostitution, a vacuum of authority...it was insane. It's been gone for nearly twenty years now, but a series of amazing photos has helped bring the "city" back to life. Originally a Chinese fort, Kowloon Walled City - located in Hong Kong - became a tiny enclave of China when the rest of the island was handed over to the British in 1898. While the rest of Hong Kong rapidly evolved into a vibrant and bustling British colony, KWC, then just a strange little speck on the map, was left without laws or governance. Occupied by Japan during the Second World War, at the conflict's end - with Hong Kong returning to British control - KWC's population surged, with thousands of squatters moving into the city. "Trapped" within the limits of its 0.0102 square mile territory, residents had to erect building atop building, as the city could never expand outwards, only upwards. Unable to get rid of them, Britain simply...turned a blind eye. It resulted in something you'd expect to see in a 22nd century dystopia, all crumbling apartments, neon lights and often filthy living conditions. In the absence of actual government, organised crime soon flexed its muscles, and by the 1950s Triad gangs were running KWC, and though their control would all but evaporate by the 1980s in the face of eventual police pressure and resident backlash, the city maintained a reputation as hotbed of debauchery, where drugs, gambling and prostitution were rife. In truth, while gangs did exert influence, KWC is more interesting as an exercise in what everyday people can do when they band together for the common good. Without any authority present to handle things like power, water and infrastructure, residents of KWC took care of this themselves, starting new construction projects and even laying water pipes. Outside of history, KWC will perhaps be best remembered by people like you and I for the influence it had on popular culture. Appearing in video game series like Call of Duty and Shenmue, in 1997 it even got its own game, Kowloon's Gate, an adventure game for the PlayStation set entirely within the walled city. Its biggest influence, though, is on science fiction in particular. Blade Runner's dark, bleak and over-populated Los Angeles was based heavily on KWC (as you can probably guess from the photos), a city so crammed in that residents had to erect floodlights in the lower levels because sunlight didn't reach them. Given Blade Runner's aesthetic has been so hugely inspirational itself, you can see how KWC played a bit part in defining a big part of modern science fiction, whether it be movies, TV, comics or games. Despite its unique self-sufficiency, by the 1980s, with a population that had reached around 30,000 (crammed into only 6.5 acres! ), both Britain and China decided that it had to go. It was deemed too unsightly and too dangerous. Demolition work began after a costly resettlement program in 1991, and was completed in 1994. The area is now...an enormous and beautiful park. I'm bringing this up today because I just came across the book City of Darkness: Life in Kowloon Walled City. Photographers Greg Girard and Ian Lambot spent five years capturing the final days (well, years) of the city, showing KWC as its residents saw it and its residents as the human beings they were, just doing their thing, getting by day-to-day, just like the rest of us. It's amazing. The book seems to be pretty damn expensive these days, but if you could track down an affordable copy, it looks like it'd be totally worth it. And if not, Greg's site below has a lot more pics.